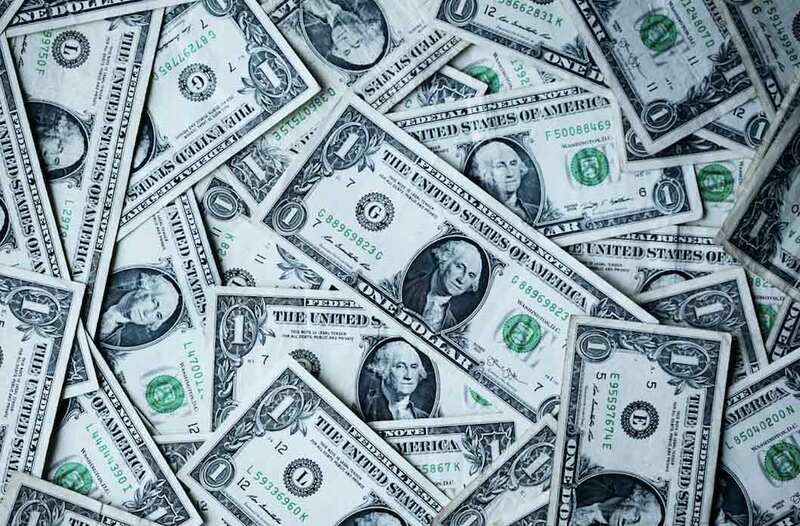 If you’re a PPC marketer, you’ve probably been asked: How much should I spend? And, what can I get in return? Whether you work in-house or at an agency, PPC forecasts and projections are part of your job…but forecasting the right budget and predicting ROI can be challenging, especially with new trends like automation, artificial intelligence, and voice search emerging. PPC marketers need to understand what their client goals are and who their audience is, to be able to determine what KPIs will look like in the future. With a KPI dashboard, PPC marketers can forecast budget based on historical data and determine projected performance. This technique allows you to predict if your budget will give you the results your client wants – if not it’s better to know beforehand right?! Similarly, if your dashboard reveals that your forecasted ad spend is under your client’s budget, then you can increase bids. 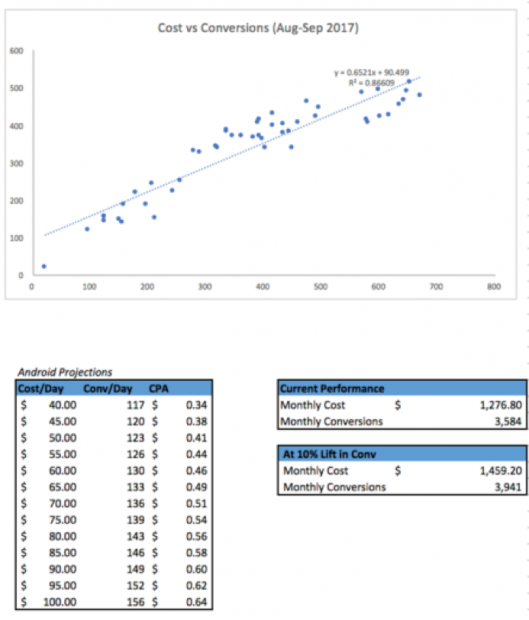 But what is PPC forecasting? PPC forecasting is the use of predictive data to increase ROI. Forecasting is the lifeblood of creating a solid PPC strategy for your client. Without forecasting and projections, you’re left guessing. Having an idea of what results may come gives PPC marketers the chance to build a better client relationship by aligning with client expectations, laying out the tactics, and preparing for new testing opportunities. 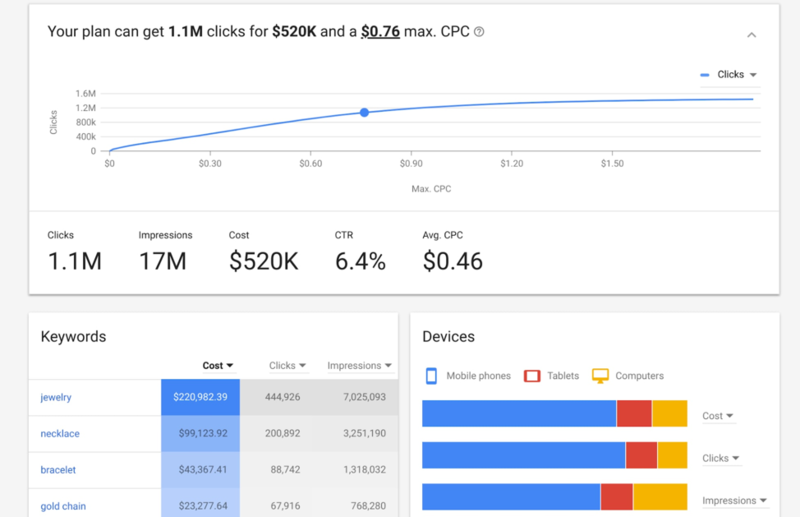 Here’s what you need to know about PPC forecasting and projections so you can determine your results before you even create your campaigns. Monthly Ad Spend: This is the maximum amount that you or your clients have to spend on PPC. 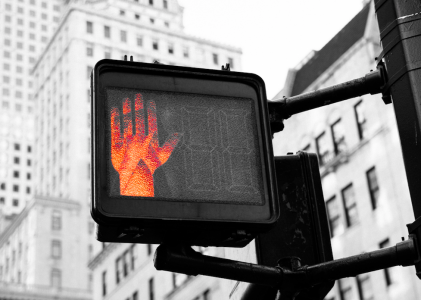 Your report should be able to determine whether or not this can be lowered or if it needs to be raised to meet PPC goals. Average Sales: This is your ROI benchmark for PPC campaigns. The ultimate goal is to increase the average sale numbers. Conversion Rate (CVR): This will tell you how well you or your client’s ads have performed thus far and give you an idea of how your PPC landing pages are performing and/or will continue to perform when you run new campaigns. 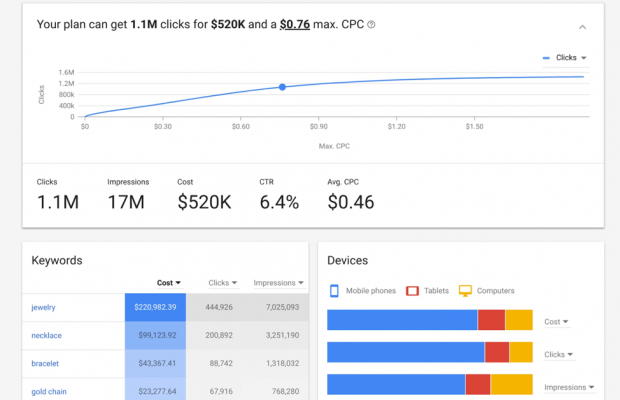 Cost Per Click (CPC): This will tell you how much you’re spending per keyword. Competitor Data: This includes things like competitive keyword research and keyword auction data and will give you insights into how your campaigns measure up against competitors. Industry Trends: This type of data should help you optimize your campaigns based on current trends and seasonality. Forecasting reports use historical data based on the factors above to manage client expectations, budget allocation and ad performance. Once you have all of the above data gathered, you should be able to analyze it and successfully forecast your PPC campaign performance. Using this analysis, be sure to make adjustments to optimize campaigns for the future. Forecasting is much easier with historical data. If you are starting fresh with a new client or one that has never run ads in the past, you’ll have to use what data is available to make any kinds of PPC forecasts. 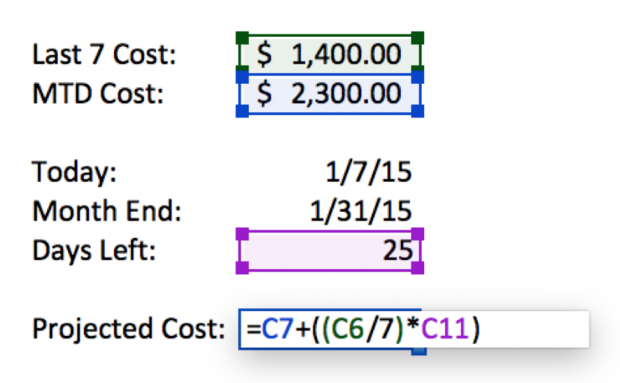 Begin by determining the cost per click (CPC) for you or your client’s targeted keyword terms. Understanding your CPC will help you determine how far your budget will stretch and if you need to increase or decrease your monthly ad spend to improve campaign performance. The best tool for this is the Google Keyword Planner. 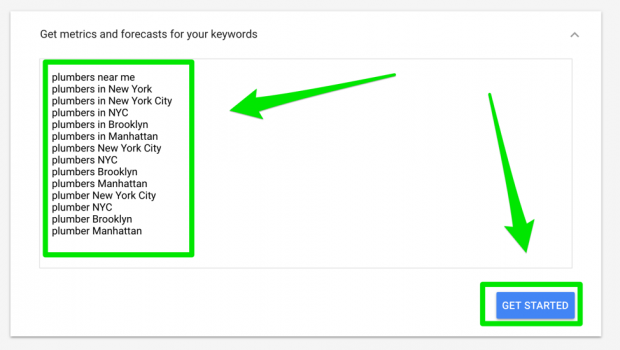 They recently released a forecasting feature alongside their keyword search tool. To begin, log into your AdWords account. Then, click the wrench icon for the tools section in the top menu and select “Keyword Planner” under “Planning” from the drop-down. Here you’ll see your results for your forecasts and your Average CPC. 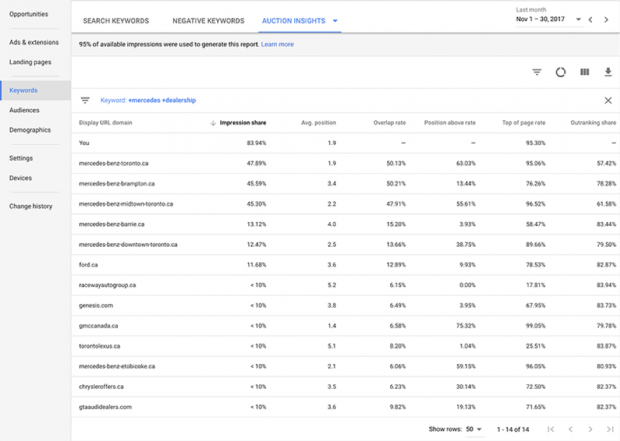 Google provides an estimate of how your chosen keywords will impact ad performance. If you click, “Plan Overview” in the left-hand corner, you’ll also be able to view keyword data, devices and location information. Once you create your campaign, you can change the max CPC by percentages to see what changes might affect performance. Using Google’s new Keyword Planner will help you create a keyword list based on predicted clicks and estimated conversions. Again, this gives you an idea of how your ad might perform within a given budget. You can also use Campaign Groups to set target performance goals to see if you’re on track to meet your projected goal. To see target performance goals, you must already have a PPC campaign running. 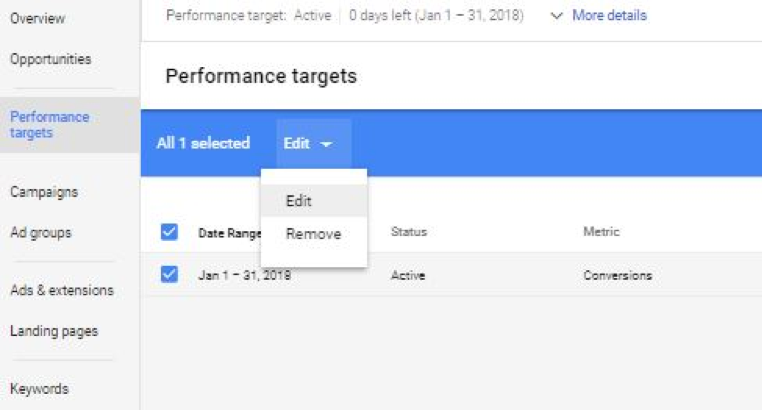 If you have a PPC campaign live, click on “Performance Targets” in the left navigation menu. Then you should be able to see the current and projected data for each of your targets and goals. Bing also offers a Keyword Planner. 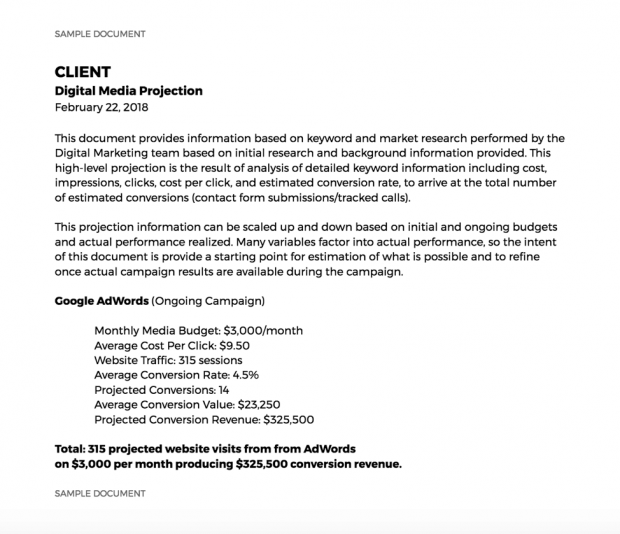 Contoso used Bing’s Keyword Planner to forecast how far their initial budget of $500 would stretch. Their product (insulated water bottles) sells for $35 with a profit margin of 40%. 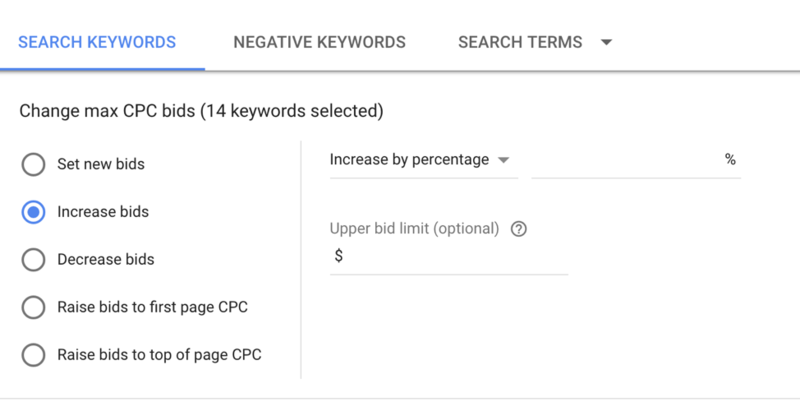 Using Bing Ads Keyword Planner, they determined their average CPC was $0.53. Based on this data, they were able to determine their estimated paid traffic (943 clicks) based on their allocated budget. They were also able to determine an estimated conversion rate (3%), estimated transactions (28) and total transactional revenue ($980). They estimated their total return on ad spend at 196%. By forecasting, they were able to measure campaign performance against their estimates to determine whether or not their efforts were worth it. Since PPC campaigns are influenced by competitor data, PPC forecasting and projections have to take this into account. It’s important to know what your competitors are doing and how their campaigns stack up against yours so that you can make adjustments accordingly and further optimize your ROI. 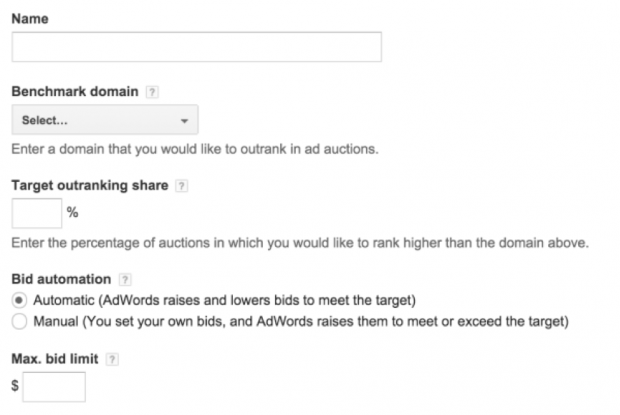 You can do this by pulling competitor PPC data with Auction Insights into Google’s Keyword Planner. However this report is based on you or your client’s previous performance in the auction, so it won’t be helpful for first time PPCers. It should be a good indication of which campaigns your competitors are running, how aggressive they are (and most likely will be) and their patterns for running ads. 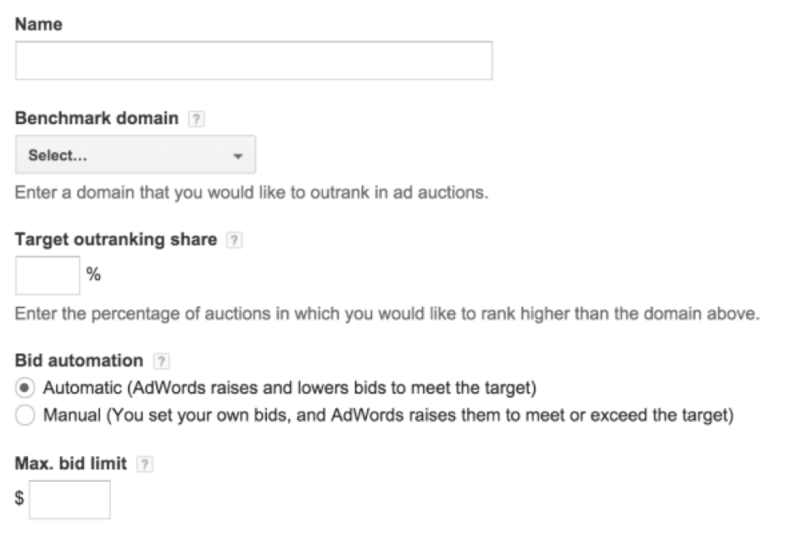 Similar to Auction Insights in AdWords, if you’re looking to outrank your competition you can use “Target outranking share” to let Google know you want to bid to outrank your competitor. For example, if you want to outrank your competitors share by 75%, Google will automatically bid to outrank your competitor 75% of the time in auctions. It’s important to continue to look at your data against your competitors. In auctions, you’re competing against thousands of advertisers. Be sure to track competitive data over time so you get a sense of their overall strategy and don’t bet your PPC goals on a one-time fluke. General trends and seasonal elements, like holidays, can also change projections and cause fluctuations in bidding, CPC prices (just ask any retailer about CPC campaigns during Black Friday), and overall ad performance. 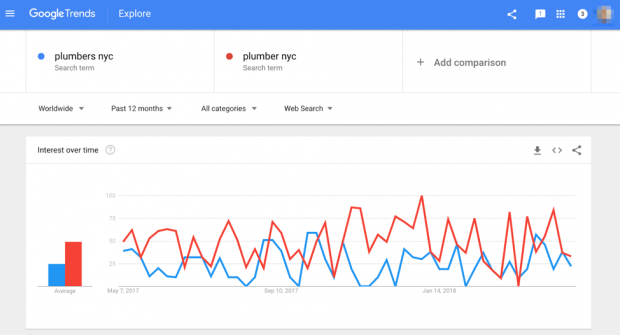 To identify important trends that might impact PPC performance, input your keywords into Google Trends. This will give you a visual representation of the latest trends based on interest over time and keyword comparisons. 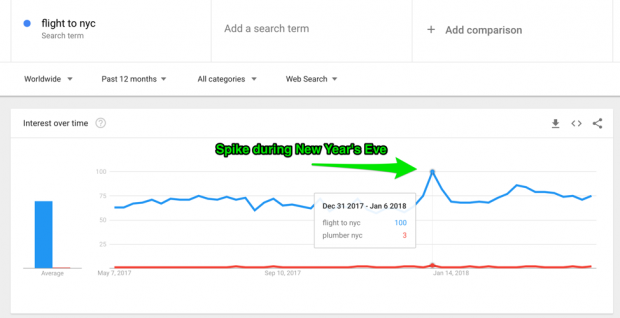 Set the time frame to “Past 12 months” and you will be able to see certain spikes or dips in keyword trends based on historical data. You can go as far back as 2004 (when the service launched) when looking for seasonal trends in data, or create a custom range to suit your research. It’s always helpful though to have at least one full year’s worth of data when looking for seasonal comparisons and trends. PPC marketers can compare search data from Google Trends with seasonal keyword term bids to help automate bidding before the next seasonal spike. If the keyword term has a predictable cycle, like the “flight to NYC” example above, you can prepare a PPC campaign. 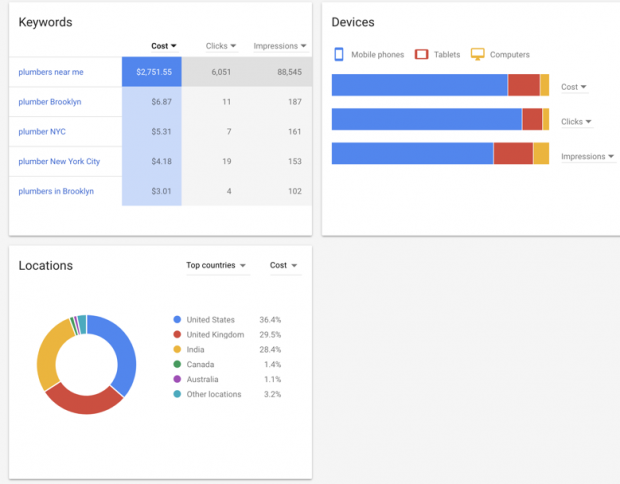 Don’t forget to export this data to save along with your other reports from Google AdWords, Google Analytics, and Google Keyword Planner. PPC is an ever-changing industry. With advances in voice search, automation, and artificial intelligence, the game is changing every single day. Just think about the growth of “same day shipping” mobile searches since 2015. The evolution of how users are shopping and searching will affect your PPC strategy, and in turn your forecast and projection reports. Staying up to date with current trends and innovations to marketing will help guide your PPC budget forecasts. And, it’s not just new technologies in PPC. Think about advancements in your client’s specific industry. Make sure this is reflected in your day-to-day PPC account optimization. Now that you have all of your data either for a new PPC client or one with historical data, the final step is to put it together into a cohesive report. We reviewed which metrics to include and how to generate data, but now you have to make sense of it all. You can use a third-party PPC campaign reporting tool for easier and faster forecast report. Or, you can opt to create your forecast and projection reports manually. Yellow Pages Group saved between 65-75% from the costs associated with 3 or 4 full-time employees just based on improved, easy-to-read PPC reporting. Sean Ballard of the Yellow Pages Group explained, “Where Acquisio shines is its ease of reporting, the fundamentals of telling the client how their campaign is doing. It’s easy for us to manage the message, and for advertisers to understand what they’re getting.” However, if you want to pull the data manually, you can create data tables to forecast short-term and long-term projection impacts. Below is a basic project report on next month’s performance using regression lines and plotting in Excel. When calculating projected costs in Excel, use the formula MTD + ((Last 7/7)*Days Left In Month). You can use this formula for whatever metric or timeframe you want. And, if you want to take it one step further, you can review day of the week budgeting so you can see the average spend per weekday. Or, you can use a forecast template like Chelsea, Account Manager of Greenlane, created. Once you have all the data collected, send the details to your client in a readable, approachable way. 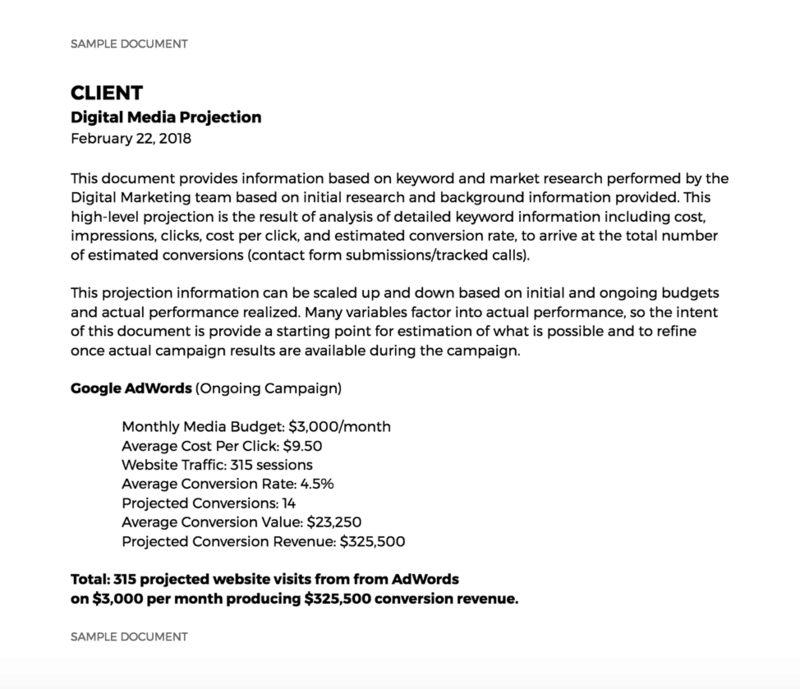 Corey Morris, Vice President of Marketing at Voltage, shared his one-page PPC projection report he created for a client. As you can see, Corey combined internal business data from his client, industry data, and other details to project potential revenue from his PPC campaign. It’s not always possible to predict the future with complete accuracy, but by using CPC analysis as well as historical trend data, you can recognize influences that might impact ROI positively or negatively. Some data will need to be updated more often than others. CPC data, for instance, will change more rapidly than industry trends and should be updated in your forecast report every week and/or month, depending on how often you run campaigns. For longer-term forecasting, use year-long trend data (or longer) to analyze the best days and times of years for specific keywords to give you optimal results over the course of time. Finally, make sure to keep your data in a centralized location. Not only does this make it easier to pull reports for other team members or clients who need access to this data, but it can help give you more historical data for further analysis. The more data you have over time, the better your predictions will be. All screenshots by author. Taken May 2018.